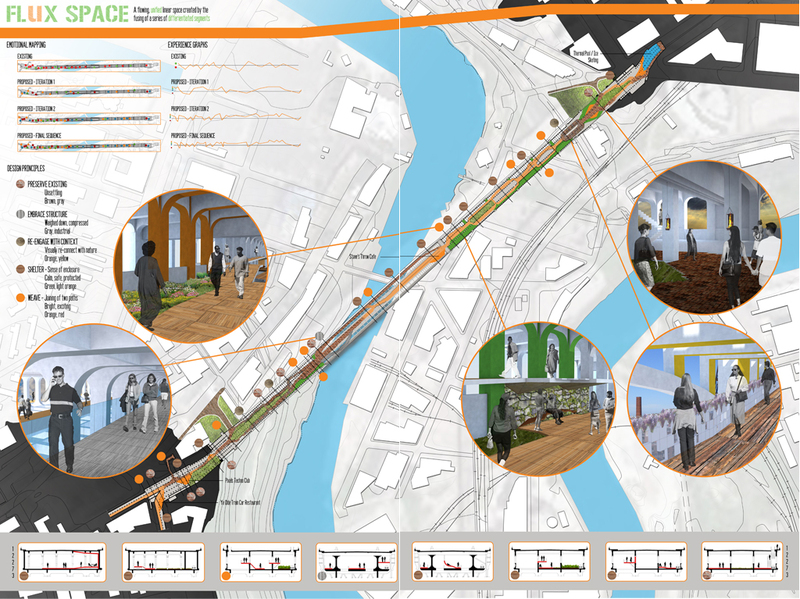 Overview: The existing experience of the Detroit Superior Bridge is widely-varied. It ranges from frightening dark corners to dull repetition to breath-taking views. Flux Space capitalizes on the areas of the bridge that are already dramatic and enhances the areas that are less engaging. Rather than analyzing the bridge as one linear space, Flux Space breaks down the bridge segment by segment. 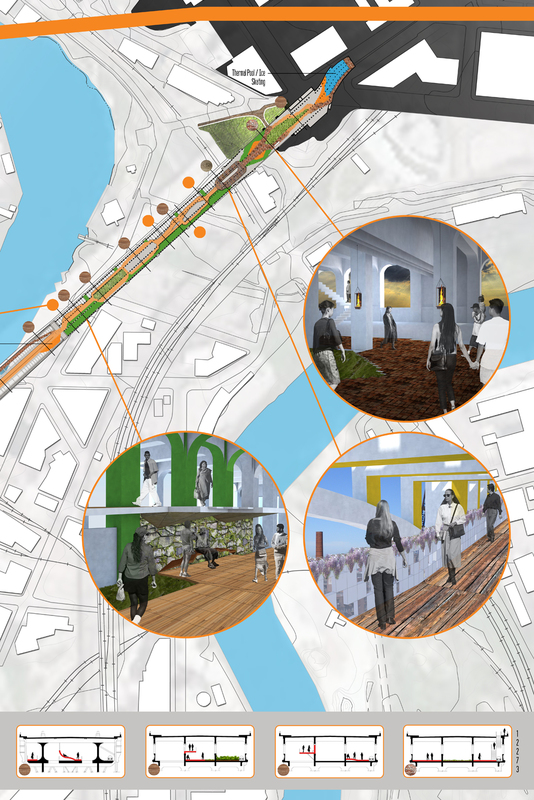 Emotional mapping of existing conditions determines that while the overall experience of the bridge is varied across its span, a wider variation and intensity of experience is necessary to engage and entice repeat visitors. Thus, through several iterations of diagrammatic mapping, a final emotional sequence is established and the five design principle are formed. Each of the five design principles are established to illicit a particular emotional response amongst visitors. According to the final emotional sequence, each segment is assigned a design principle. The five design principles are weave, shelter, preserve existing, re-engage with context, and embrace structure. 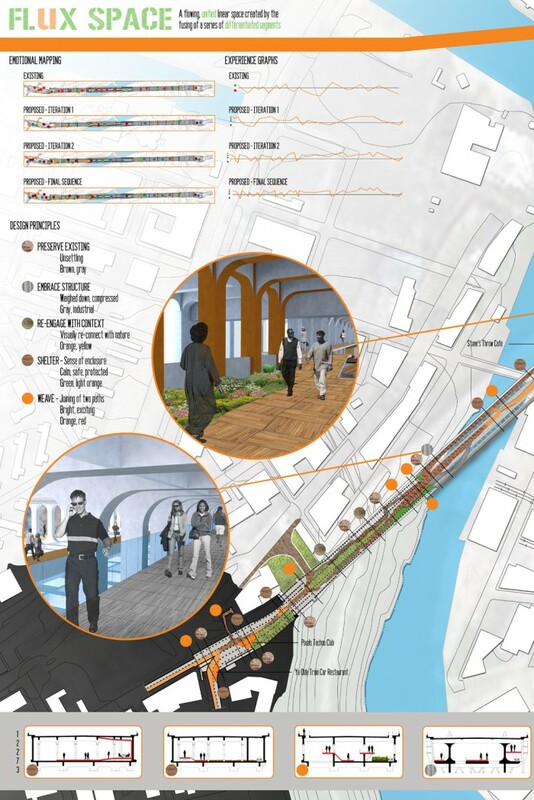 When each segment is designed according to its design principle, and the segments vary across the bridge’s span, an emotionally engaging experience is created that perpetually subverts visitors’ expectations.